This phantom black pearl sedan has an automatic transmission and is powered by a 2.4L I4 16V GDI DOHC engine. Equipped with that economical motor it gets 9.8 L/100 km in the city and uses just 6.9 L/100 km out on the highway according to Transport Canada. Our Sonata's trim level is GL. 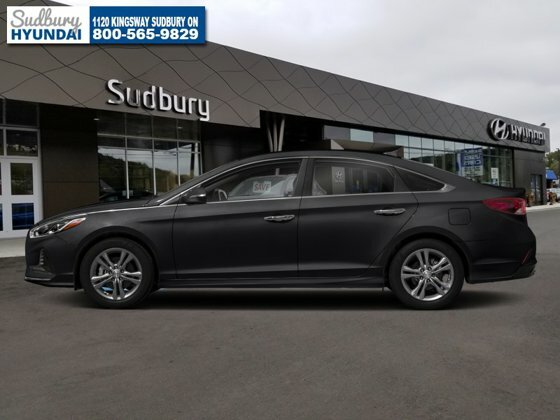 The base trim 2018 Sonata GL will definitely surprise you with the amount of standard fitted options such as a 6 speaker stereo with a 7 inch display, Bluetooth and USB connectivity, smart phone integration, heated front bucket seats, cruise control, air conditioning, remote keyless entry with illuminated entry, a leather wrapped steering wheel, metal look interior panel inserts, blind spot sensors, rear collision alert, a back up camera and more. This vehicle also has the following features: Heated Seats, Bluetooth, Blind Spot Detection, Remote Keyless Entry, Collision Warning, Air Conditioning. To view and download a brochure open this url https://www.hyundaicanada.com/-/media/hyundai/showroom/2018/sonata/brochure/h17q2-bro-so-1075_sonata_brochure-web_en.pdf" target=_blank>https://www.hyundaicanada.com/-/media/hyundai/showroom/2018/sonata/brochure/h17q2-bro-so-1075_sonata_brochure-web_en.pdf. Total rebate of $2000 is reflected in the price. Rebate of $2000 is reflected in the selling price and qualifies for 4.27% Hyundai Smart Rate Financing Rate. 4.27% financing for 96 months. Buy this vehicle now for the lowest bi-weekly payment of $143.48 with $0 down for 96 months @ 4.27% APR O.A.C. ( Plus applicable taxes - $440 documentation fee / Total cost of borrowing $4581 / Total Obligation of $29845 ). Incentives expire 2018-07-03. See dealer for details.